Ask a mid-sized company what their transportation challenges are these days and you might receive a response like “How much time do you have?” From rising costs to changing retailer demands, there is certainly no shortage of issues to go around. To make sense of it all, KANE recently completed a study of 108 companies and found that LTL transportation is not just one of many headaches, it is a top concern. In its transportation survey of mid-market companies, KANE asked over 100 respondents about the current transportation landscape. Following is a summary of the responses. Provided with a list of common challenges, “often have to ship less than a truckload” topped the list at 63.6% of responses. The next-most-common response, “often pay premium rates to move product,” was cited by 31.8% of respondents and could be considered part and partial of the LTL shipping requirement. Less frustrating to mid-tier shippers, but still concerning to them was “limited load track and traceability,” cited by 27% of respondents. Shippers are increasingly less tolerant of being in the dark about freight in transit. Only 17.8% of respondents said that load consolidation would not be valuable. The majority (35%) responded with “I would need to know more,” while 26% said that consolidation would be very valuable. The remaining responses (20.6%) were neutral. Freight consolidation holds a huge upside in a distribution market where tens of thousands of retail suppliers, many located in the same region, ship to the exact same retail distribution centers. In general, the survey seems to indicate that shippers recognize the opportunity for freight consolidation but are not sure how to take the next step. Hmmm, so when it comes to the cost of trucking services, high LTL transportation rates are the biggest concern of mid-tier shippers. Yet a large majority are not currently consolidating LTL loads to create lower cost truckload shipments. There’s the will, but not the way. 3PLs that offer retail consolidation services can be the catalyst for freight consolidation since they can bring like shippers together for mutual freight savings. In essence, they act like a dating service for shipments destined for large retail distribution centers. What’s So Challenging About LTL Transportation? To people within the logistics industry, it is not all that surprising that most of these mid-size companies cited LTL as one of their biggest transportation challenges. There are – and have been – several reasons why LTL is a headache for shippers that only seems to be worsening. High rates are rising higher. LTL has always been an expensive shipping method, but increasing demand plus tightening capacity are contributing to increased LTL shipping rates. Shipments take longer. LTL shipments can take up to twice as long as a consolidated truckload shipment. For example, a consolidated TL shipment from Pennsylvania to Arizona takes about 3 days, compared to 6-10 days for LTL. Delivery windows can be missed. Longer LTL shipments reduce the odds that you will meet your delivery window. This can result in chargebacks and other consequences with retailers. Damage rates are higher. An LTL shipment moving from the east coast to the west may pass through as many as six LTL freight shipping terminals. Damage rates increase every time a product is touched. Boxes can get dropped, cartons can get crushed. Over time, even small increases in damage rates can exact a heavy financial toll. Green initiatives suffer. With LTL, many different companies are shipping goods to the exact same location, yet operating completely independently. This puts more trucks on the road, blocks up already crowded highways, and emits more greenhouse gases into the atmosphere. Just as the study revealed LTL transportation to be a major challenge, it also presented the solution to this challenge – whether respondents knew it or not. Many companies are simply unfamiliar with load consolidation and thus unable to solve for one of their biggest challenges. 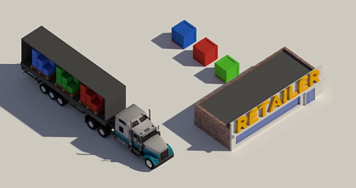 Check out this primer video on retail consolidation. Companies who shift to this model from LTL transportation can cut retail distribution costs by over 20%, while also shaving 15% off warehouse costs by sharing overhead, space and labor with other shippers. Consolidation is also a flexible solution, as a 3PL can flex space and labor allocation based on seasonal and other demand fluctuations. Mass transit, shuttle buses, rideshare programs – these are modern society’s solutions for moving PEOPLE when all those people are going to the same destination. We can utilize load consolidation to do the same for our products. To learn how your company can benefit from a load consolidation strategy and eliminate the challenges associated with LTL, contact KANE today.